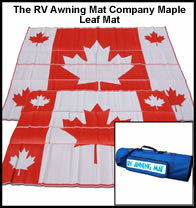 Until I saw these mats/rugs I thought the $15 piece of indoor/outdoor carpeting I bought on clearance at my local home improvement store a few years ago was a great way to keep the mud and dirt at campsites from all tracked inside my camper. 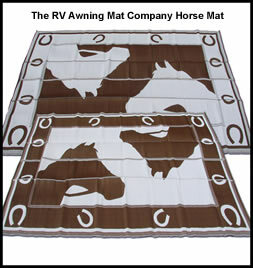 But now........I found these really cool mats/rugs at the RV Awning Mat Company. 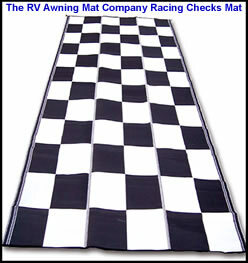 Plus, they have carrying bags available which will keep any dirt and dust from getting all over your storage area. These sure make my green carpeting look sad. When I first saw these I thought they would be really expensive, but they're not. 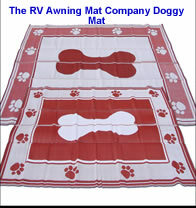 For instance, the 9x12 red doggy mat is currently on sale for $59.99. 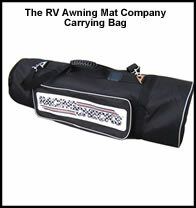 A combo that includes the mat and a carrying bag is $67.99. 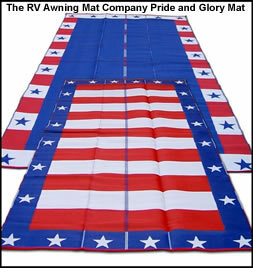 One of these mats is going on my "to buy" list for camping next year. Now all I have to do is find a way to wreck that indestuctible piece of indoor/outdoor carpeting on our next camping which is our last for the year. If I wreck it (or maybe I could find a way to lose it), then I could justify the purchase of a new one.